African mango, also known as Irvingia gabonensis, is a fruit from a tree native to Central and West Africa. The fruit looks similar to the mango you might see in the produce section, but below the surface, it’s even more of a nutritional powerhouse. The flesh of the African mango is edible and a good source of nutrition. It’s this fruit’s seed that’s at the heart of its health benefits – including its rich fiber content. The benefits of African mango have long been recognized in Central and Western Africa. Over the past decade or so, research on the benefits of African mango have contributed to its popularity in the West. If you are considering taking African mango supplements, here is what you need to know about the benefits and how to use it for optimal health. In one study , 102 participants who took African mango pills twice a day showed measurable improvements in weight reduction, reduced body fat percentage and waist circumference. (x) Anecdotal evidence from people who have taken African mango for weight loss claims that the supplement suppresses appetite and possibly helps regulate blood sugar levels, both of which can reduce binge eating and boost energy levels. According to the CDC, 71 million Americans – or roughly a third of the population – have elevated low density lipoprotein (LDL) cholesterol. (x) LDL is the “bad” type of cholesterol, and when levels are high a person has an increased risk of suffering from a heart attack and dying from heart disease. One of the buzzed-about benefits of African mango is its ability to regulate blood sugar levels. So is mango good for diabetes? The research says yes! In one 10-week study, , participants who took African mango supplements showed significantly reduced blood glucose levels compared to those who didn’t take the supplement. (x) If you have diabetes, follow your doctor’s guidance before taking any supplements, but early research does suggest that African mango—paired with a healthy lifestyle—might be useful in treating diabetes and pre-diabetic conditions. In areas where the African mango is native, practically all parts of the plant have been used historically for medicinal purposes. For instance, the bark of the plant is known to produce an analgesic effect and is used as an antibiotic. (x) In Western culture, you’ll find supplements, oils, powders and extracts sourced from the seed of the fruit. Traditional uses of the plant include treating hernia and yellow fever, easing digestive and gastrointestinal issues, and as a fever reducer. The FDA publishes guidelines for dosage recommendations on many supplements. However, this is not often not the case with supplements that are the powdered or extracted form of a whole food. Since African mango can be eaten safely, there are currently no formal dosage guidelines for African mango supplements. That said, clinical studies conducted using dosages of 150 mg twice a day to 1,050 mg three times a day have been shown to to be safe. 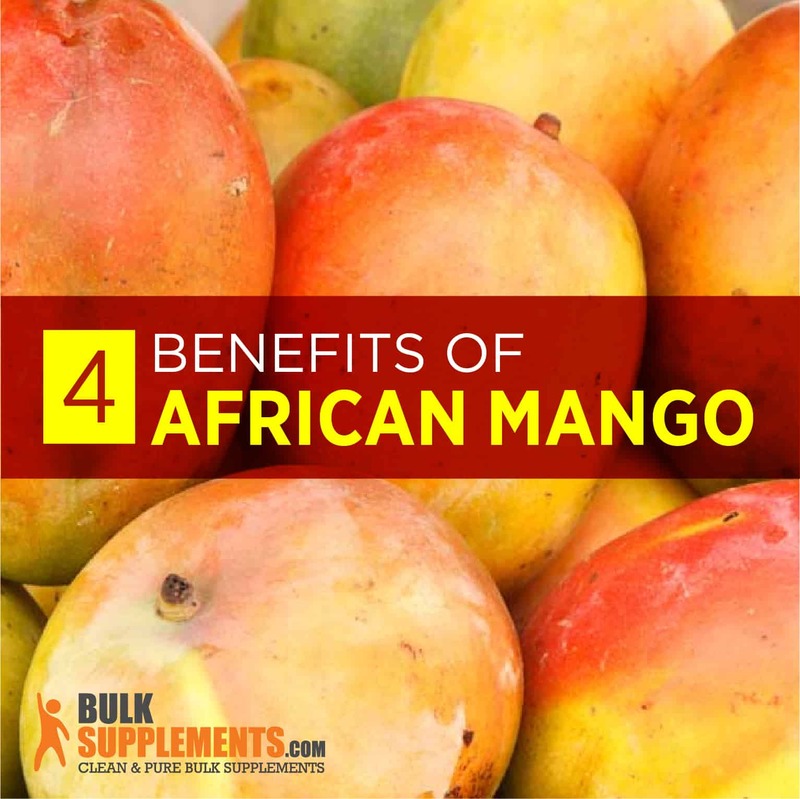 (x) This includes African mango supplementation from a variety of sources, including powders, pills and extracts. As with any new supplement start out on the lower end of the recommended dosage range to assess your tolerance and then increase the dosage gradually. 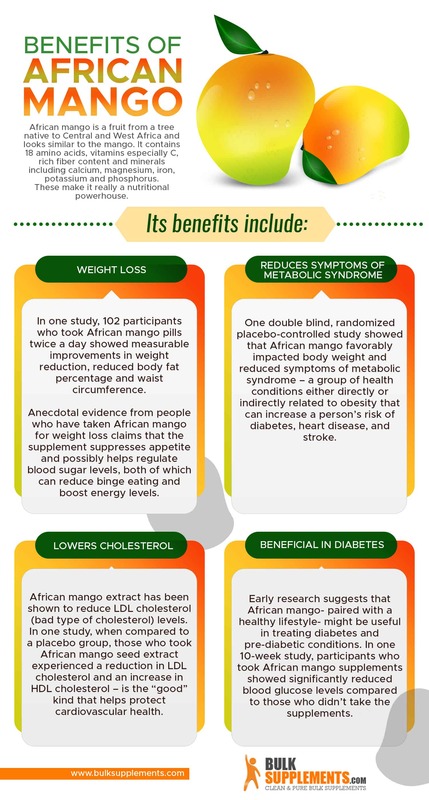 There is no evidence of significant African mango side effects. Mild side effects of African mango supplements include dry mouth and gastrointestinal upset. Stomach upset might be caused by the fact that African mango delays stomach emptying. (x) There are no known risks involved with taking African mango supplements for people who are otherwise healthy and have no known allergy or sensitivity to the fruit. (x) As always, it is wise to speak with your doctor before beginning supplementation. This delayed digestive response is also something that you should keep in mind if you’re taking any other supplements or medications, as it can affect your metabolic rate. For this reason, your doctor may advise that you take your medications and African mango separately to promote better absorption. To live your healthiest life, it’s important to fuel your body with foods like African mango that support healthy body function on all levels. If you’re looking to lose weight, improve your cardiovascular health or reduce your dependence on medications to control diabetes, then African mango is a supplement worth considering. As always, speak to your doctor first before beginning any new supplement regimen.